Aukey is one of the best known makers of mobile accessories, with a massive range of chargers, battery packs, speakers and so on. 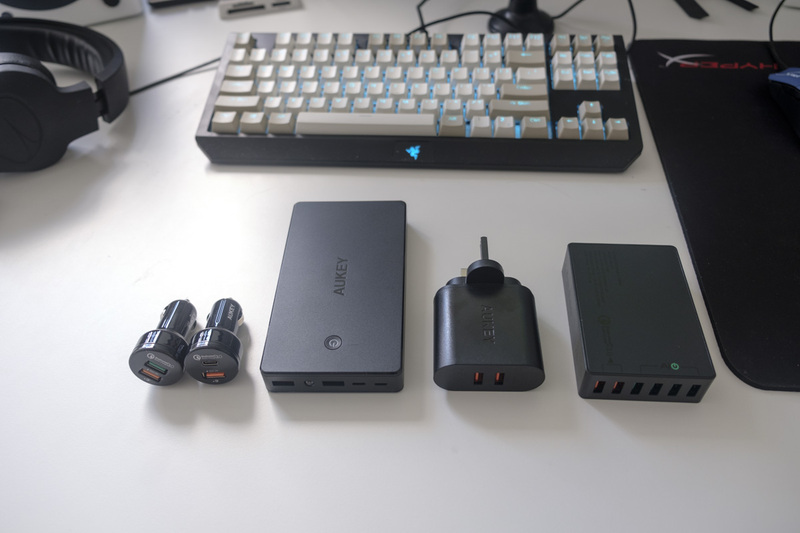 Today, we’re looking at five chargers of various kinds from Aukey with a common trait: Quick Charge compatibility. 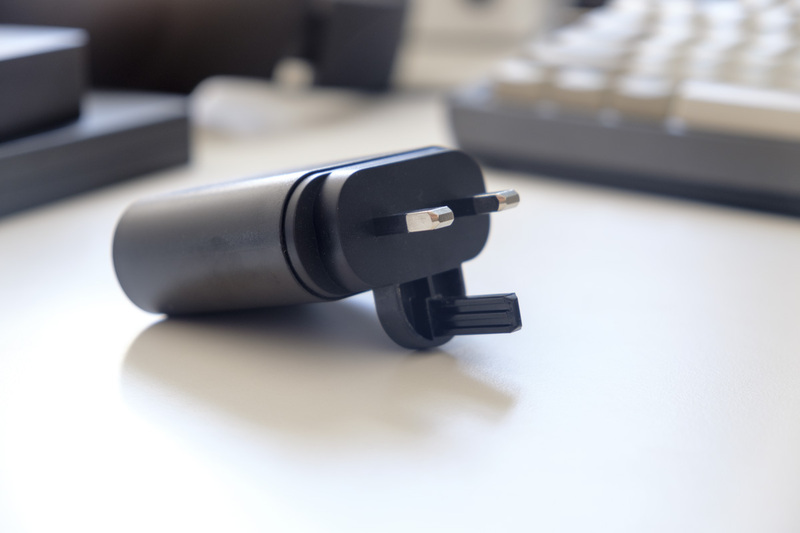 Let’s cover what Quick Charge is, then get right into the review! As the name suggests, this Qualcomm charging standard allows you to recharge your phone in a fraction of the time of standard charging practices, largely through allowing higher voltage charging. Quick Charge 4.0 models will be able to go from 0% to 50% capacity in just fifteen minutes of charging; earlier versions of the standard offer nearly the same. Quick Charge is found on many Android phones with higher-end Qualcomm chips, including models from Samsung, LG, HTC and others. You can learn more about Quick Charge here. Which models are we reviewing today? NOTE: You can click the links above (or in the Contents menu on the left, on desktops) to navigate quickly to the review you’re most interested in. All items come with a user manual and warranty card; the portable charger and car chargers came with a Micro USB cable; the charging station came with a cloverleaf power cable. All products came in cardboard boxes and were well packed. Let’s start with the PB-T10. 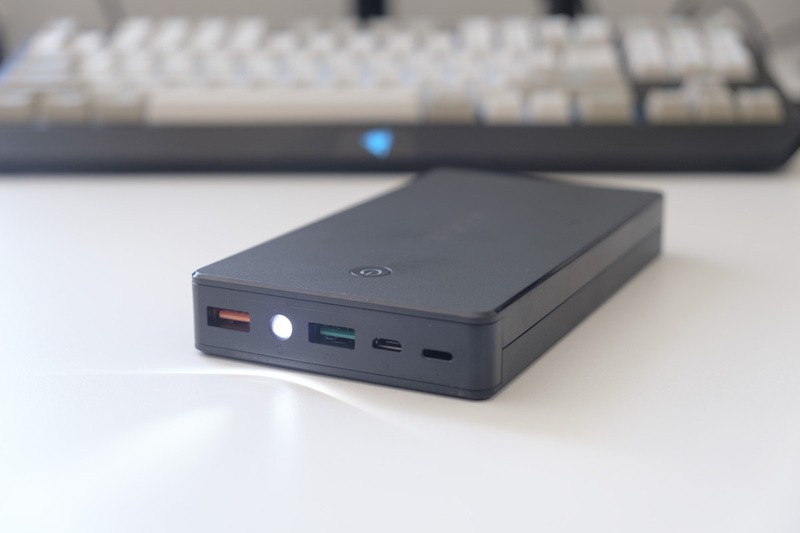 This power bank is a big one, rated at 20,000mAh, so it should be able to fully recharge most smartphones almost half a dozen times before needing a recharge itself*. * If we (generously) assume that we need 125% of a smartphone’s rated capacity to recharge it fully (given the various inefficiencies in power bank charging), we can calculate how many full recharges we should get before needing to charge the power bank itself. We can recharge our hypothetical 3200mAh smartphone five times (20,000 / (3200 * 1.25) = 5). 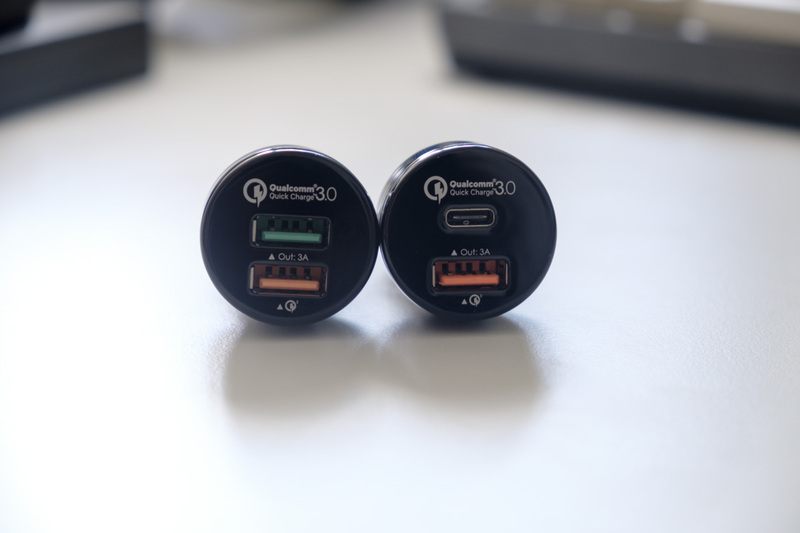 The power bank has two full-size USB output ports. The orange-coloured one is Quick Charge 3.0 enabled and allows for rapid charging for compatible smartphones; your phone will automatically choose from up to 6.5V @ 3A, up to 9V @ 2A or up to 12V @ 1.5A depending on its capabilities. Meanwhile, the green-coloured port provides a standard 5V @ 2.4A recharging source. That means the majority of Apple and Android devices will be recharged at their maximum speed, and we can even recharge two devices at once — awesome. Interestingly, the PB-T10 also has two power inputs: one Lightning, one Micro USB. It’s quite common to see Micro USB inputs only on power banks, which is a hassle for iPhone owners as it means they need to keep both a Micro USB and a Lightning cable. With the PB-T10, that’s not necessary — very cool. There’s also an LED indicator which changes colour to tell you how much juice the power bank has: 0 to 30% is red, 30 to 70% is green and north of 70% is white. Finally, the power bank has a button which can be pressed to begin or halt charging, or held down to turn on an integrated LED flashlight. It’s certainly not the most important feature of this power bank, but it’s a nice bonus that could come in handy if you’re opening your door in the dark, camping or just need to avoid some obstacles on the walk home. The PB-T10 is pretty chunky, measuring 15 x 8 x 2 centimetres, and it weighs a little under 400 grams. That means it’ll struggle to fit in all but the largest pockets; you’re better off putting this in a bag. This isn’t surprising given its capacity, but it is worth keeping in mind. The construction is entirely plastic, but the T10 still feels well put together so durability shouldn’t be a concern. The power bank also comes with a 24-month warranty, which should further allay potential fears. In our testing, the T10 performed to expectations, recharging our Galaxy S7 Edge from 55% to 100% in 55 minutes. 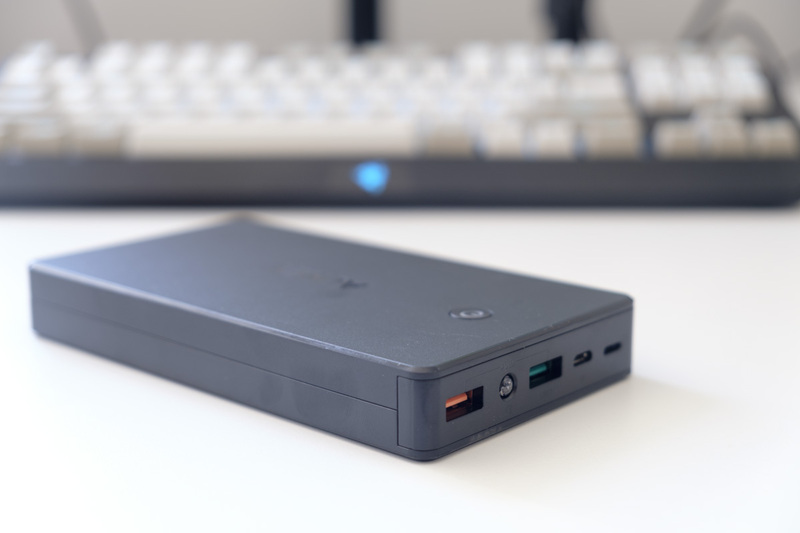 We didn’t find any flaws, although we will note that some other portable chargers are made from more durable aluminium or come with integrated charging cables. Beyond these missing features, we have nothing bad to say about the PB-T10. Next up we have the USB wall charger, the PA-T16. The T16 provides two Qualcomm Quick Charge 3.0 ports, allowing for rapid charging of two phones while taking up only one mains socket. As before, your device will negotiate up to 6.5V @ 3A, up to 9V @ 2A or up to 12V @ 1.5A. Devices that don’t support Quick Charge will receive a straight 5V @ 2.4A, still allowing for faster charging than most mains chargers on the market, even those for iPads and other tablets. Thanks to the amusingly large UK plugs, this is not as sleek a device as it is in Europe or the United States, measuring 6.4 x 6.3 x 2.8 centimetres and weighing 222 grams. 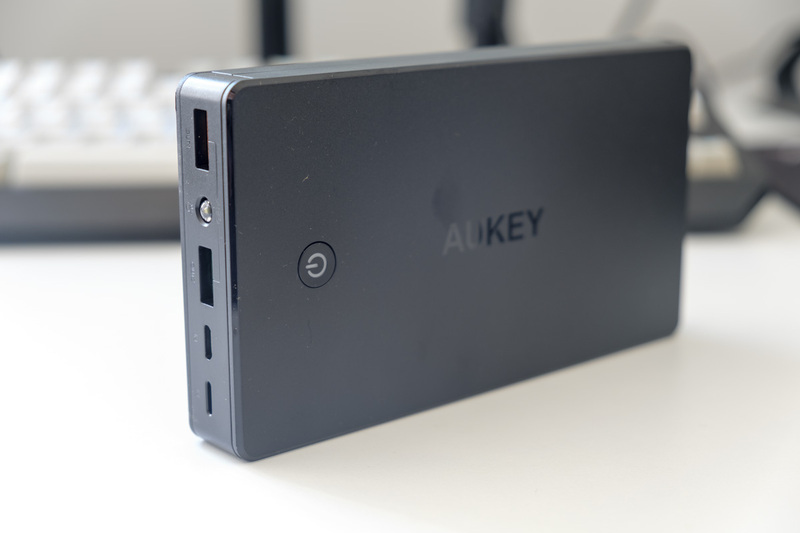 Interestingly, it’s substantially larger than the single-port version that Aukey also make; I would estimate it is about 33% larger in most dimensions. In our testing, the T16 again performed to its standards, recharging our Galaxy S7 Edge test phone from 0 to 50% in about thirty minutes. Once again, we can’t fault the T16 in its performance or design, but we will again note that some UK-specific devices are capable of folding, minimising their size, but this is still a rarity so it’s not much missed. Otherwise, all is well with the PA-T16. The PA-T11 is a charging station, designed to recharge all of your many USB devices — including phones, tablets, smartwatches, Bluetooth speakers, etc. — in one place. 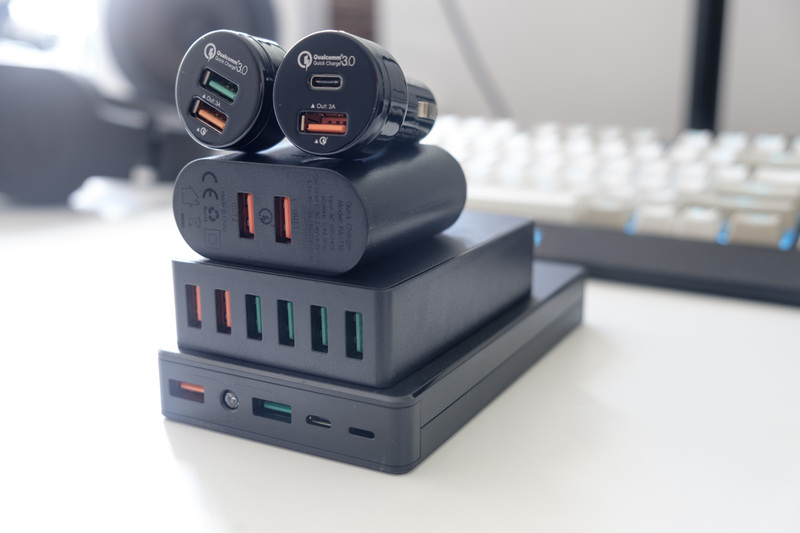 That’s great for keeping on your bedside table or in the living room, and it’s a wonderful way to recharge on holidays too — just bring one adapter that matches your destination’s power sockets, and you recharge up to six devices at once. Following earlier trends, the T11 has four green-coloured ports that provide 5V @ 2.4A; perfect for Android and Apple devices that don’t support Quick Charge. There are also two orange-coloured ports that do support Quick Charge, providing up to 6.5V @ 3A, up to 9V @ 2A or up to 12V @ 1.5A. Not many charging stations on the market offer Quick Charge, and it is a nice inclusion if you have one or two smartphones that support the standard. 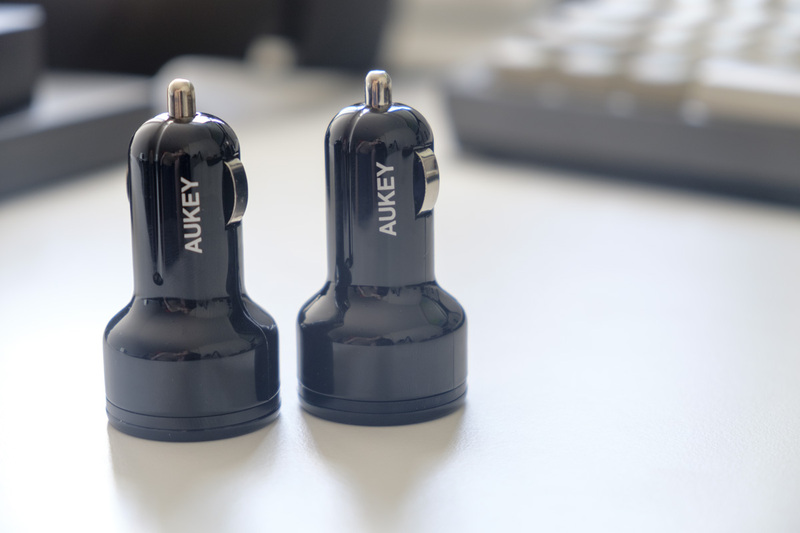 Elsewhere, Aukey haven’t rocked the boat, with the standard ports-on-one-end, power-input-on-the-other-end black rectangular prism design. It feels reasonable durable, despite not being made of metal, and should perform its desired function with ease. In our testing, we recharged our venerable Galaxy S7 Edge, alongside a Gear Fit 2 fitness band, an iPhone 6 Plus, an Apple Watch and two portable chargers, all from one mains outlet. Isn’t modern technology wonderful? If you’ve read every word so far, you’d guess that this is where we’d bemoan a few missing features from Aukey’s design… and now we’ll buck that trend by saying that Aukey have covered all of the bases, and there’s nothing really lacking in this charging station. Moving on! Now we have the first of two car chargers. Both are small, black and sensibly designed, with two USB ports at the front and a standard cigarette lighter shape on the back. 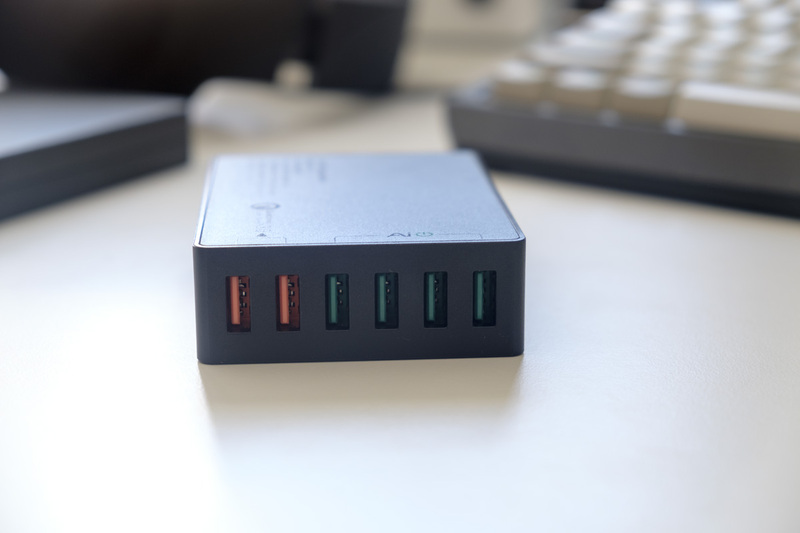 The CC-T7, which we’re briefly discussing now, has a more traditional design with two full-size USB ports; the orange one supports Quick Charge 3.0 (6.5V @ 3A, up to 9V @ 2A or up to 12V @ 1.5A), the green one pushes out 5V @ 2.4A. Both can be used simultaneously of course, and in our testing performed admirably. Our final item is the other car charger, the CC-Y1. This car charger has that mould-breaking technology in it, USB 3.1 Type-C, aka USB-C! This handy connector works either way up, is reversible and is generally capable of transmitting more power and data than its predecessors. This means that you get 5V @ 3A from the USB-C port, enough to charge most smartphone and tablet-sized USB-C devices, but not to charge most USB-C laptops or the Nintendo Switch at full speed. 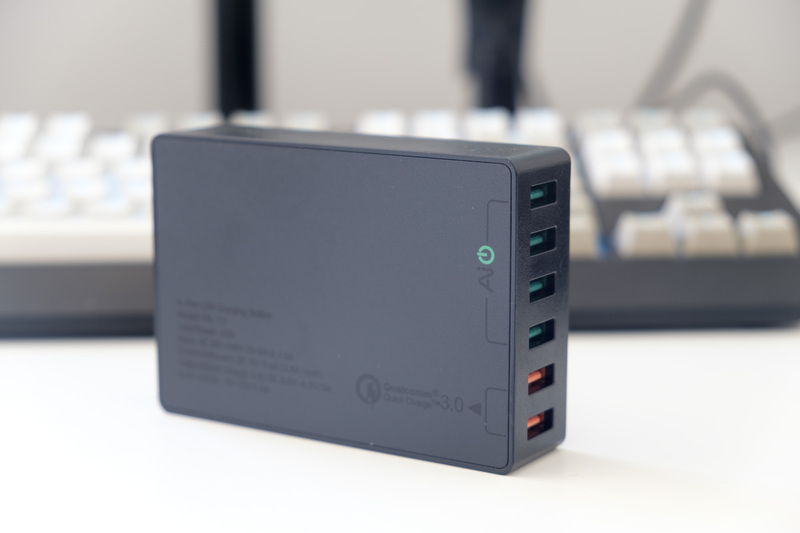 The other port is unsurprisingly a Quick Charge 3.0 port, which provides the same 6.5V @ 3A, up to 9V @ 2A or up to 12V @ 1.5A as its friends in the other accessories we’ve reviewed today. 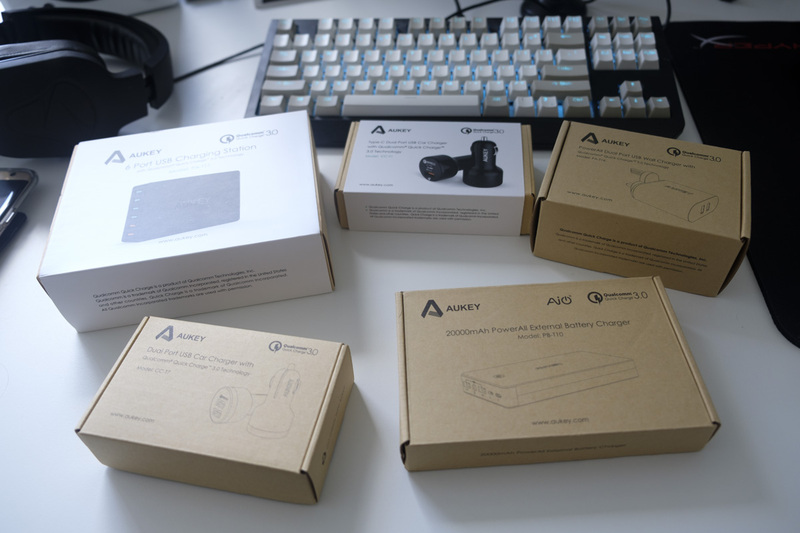 Each of Aukey’s Quick Charge 3.0 accessories lived up to expectations. While we would have appreciated more robust metal designs, there was precious little each to complain about as we tested each item. If you’re considering an upgrade for your Quick Charge smartphone, these accessories should do the job nicely.